A wide selection of 925 sterling silver chains. Assortment includes jewelry with various weave - for example, ankier, figaro or cordel. We offer silver chains, shiny or gold-plated, with various types of pendants - angels, stars, clover and many others. Our offer also includes celebrity fashion jewelery. The chains were made with the greatest attention to detail. They perfectly match everyday stylizations and work well with starting outfits. A delicate, silver chain with a weave of ankier, decorated with three connected contours of hearts. ..
A delicate, silver chain with a weave of ankier, decorated with three triangles connected with e..
Material: silverFeatures: adjustable lengthWeave: koreanaLength: 45 cm + 3 cm adjustmentWeight: 2.8 ..
Silver delicate male chain in armor weave. Made entirely of the highest quality 925 silver. Due to t.. 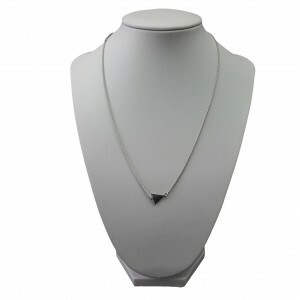 Length: 44 cmWeight: 2.39Color: silverMaterial: silver, 925Clasp: silver, 925Other: missing.. Length: 48 cmWeight: 3.15Color: silverMaterial: silver, 925Clasp: silver, 925Other: missing..
A delicate, silver chain with a Rolo weave, decorated with seven stars. The necklace is very subtle .. Traditional Italian chain made in aweave of triple tape .. 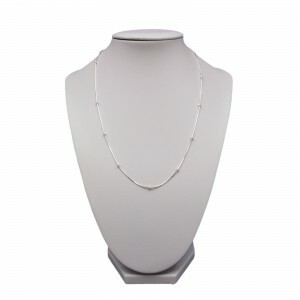 Length: 45 cmWeight: 2.15 gColor: goldMaterial: gold-plated silver, 925 Clasp: gold-plated silv..
Gold-plated silver chain with a length of 45 cm. Perfect for every day, a chain with a clover-shaped..
A delicate, silver chain with a Korean weave, decorated with a gilded symbol of infinity. The neckla..
Delicate, chain made of gold-plated silver with a weave of rolo, decorated with hearts. The necklace..
Delicate, gold-plated chain with a weave of ankier, with hearts, clover and cubic zirconia. The neck..
Delicate, chain made of gilded silver with a weave, decorated with seven tiny feet. The necklace is ..
Delicate, chain made of gilded silver, decorated with a hoop motif. Ideally suited to everyday styli..
Delicate, gold-plated chain with a Korean weave, decorated with a star. The necklace is very subtle ..
Delicate, gold-plated chain with a Korean weave, decorated with the outline of star. The neckl.. Traditional Italian chain made in a weave of 3 strands, with a length of 45, 50 or 55 cm. Delicate w.. Traditional Italian production chain made in a weave, with a length of 45 or 50 cm. Delicate with a .. Traditional Italian chain made of silver, the largest attempt of 925, with an available length of 45.. Length: 44 cmMass: 2.33Color: silverMaterial: silver, 925Clasp: silver, 925Other: missing.. Traditional Italian chain made in a pendant weave, 50 cm long. They can be worn by both Ladies and G.. Traditional Italian chain made in a weave with a 50 cm length. Delicate with a very nice glow, suits..
Delicate, silver chain celebrity with a weave, decorated with cubic zirconia and three hearts. The n..
Delicate, silver chain celebrity with a weave, decorated with zircon and two hearts. The necklace is..
Delicate, silver chain celebrity with a weave, decorated with zircon, heart and clover. The necklace.. Traditional Italian production chain made in an invisible weave, available in 45 cm length, adjustab..